B110 BANDO POWER KING V-BELT. 113" OC x 21/32" TW. 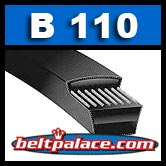 B110 BANDO POWER KING V-BELT. 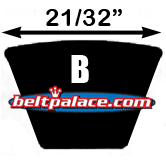 Industrial Grade Classic V-Belt profile B-110. Spec: 113" OC x 21/32" (~5/8") TW.